Moroz L.V., Paliy M.G., Tkachenko T.V. In this study, which enrolled 144 patients with acute viral hepatitis B, we investigated the peculiarities of acute viral hepatitides accompanied with dysbiotic disturbances and the possible ways to correct the latter using an enterosorbent Enterosgel, as well as the effects of this medicinal product on immunological markers. It has been established that adding enterosorbent Enterosgel to the comprehensive treatment of such patients contributed to toxidrome suppression, prompt regression of major clinical signs of the disorder, gastrointestinal microbiocenosis normalization and improvement of immunological markers. 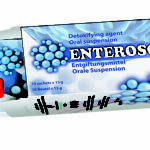 Enterosgel can be safely used in patients due to its good tolerability profile and absence of adverse effects.